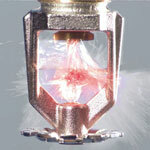 Utilizes glass bulb; same functionality as a sprinkler head, bursts when the set temperature is reached. Used in various applications: home, industry, automotive, marine, technology, etc. 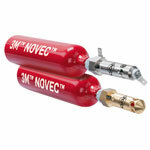 AMFE™ and 3M™ NOVEC™ prevent the spread of fire. 3M™ Novec™ Fire protection fluid is a next generation clean agent Halon alternative. It combines outstanding extinguishing performance with an excellent environmental profile. Novec fire protection fluid has zero ozone depletion potential, a global warming potential of one, a five day atmospheric lifetime, and a large margin of safety for occupied spaces. Novec fire protection fluid extinguishes fire primarily by removing heat from the fire. It is also electrically non-conductive. No Water, No Damage, No Worries. Designed for quick clean agent fire extinguishing, leaving valuable and sensitive materials clean and operational. The AMFE is “MADE IN GERMANY” and manufactured in accordance with all applicable standards and laws. The Automatic Miniature Fire Extinguishers (AMFE) are to be used with manufacturer supplied fire extinguishing agent cylinders. These red cylinders contain the approved extinguishing agent 3MTM NOVECTM Engineered Fluid. (in accordance to the maximum expected permanent ambient temperature). 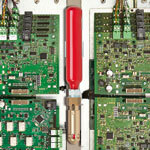 The AMFE™ product line is an innovative product for stand-alone device-integrated fire protection. AMFE is used to protect small enclosed volumes which are not accessible for members of the public or other, also professional personnel during normal operation. AMFE™ Detects & extinguishes a fire inside electrical devices, preventing the spread of a fire. This is made Possible with 3M™ NOVEC™ Engineered Fluid.